Cool looking double sleeve long sleeve infant shirts with fun surf graphics. Outfit baby in some cool surf style with these unique layered-look baby tees. 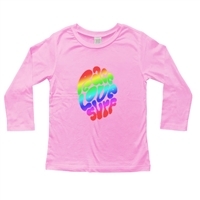 From the Surfer Baby logo in cute pink or rugged army green to the psychedelic rainbow colored Peace Love Surf, these warm surf-inspired tshirts are great for your little Surfer Baby or as a baby shower gift because "You're Never Too Young to Be Cool!"